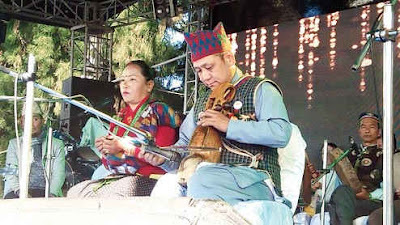 Kalimpong: More parties opposed to the ruling dispensation in the hills have termed the tourism festival as an insult to the memory of those who died in the recent statehood agitation. Harka Bahadur Chhetri, the president of the Jana Andolan Party (JAP), said while his party was not opposed to the staging of festivals per se, it was opposed to the timing of the latest jamboree. "Why do you want to entertain tourists at a time when the tears on the faces of the families of the 13 who died in the agitation are yet to run dry? In my opinion, this (the festival) is nothing but a political spectacle being staged by those running GTA 2," he said. Chhetri also said festivals were not needed to woo tourists to the hills. Pratap Khati, a leader of the Akhil Bharatiya Gorkha League (ABGL), was equally scathing in his criticism of the Tamang-Thapa duo. "Binay and Amit have become the stooges of the state government. Why organise a festival when so many people have died for the cause of Gorkhaland? Why insult their supreme sacrifices? At least this year, there shouldn't be any festival. We are losing the battle to the state government, we are being suppressed. People are languishing in jails. What is there to celebrate? This is not right," he said. More parties opposed to the ruling dispensation in the hills have termed the tourism festival as an insult to the memory of those who died in the recent statehood agitation.